Vignelli’s signage introduced uniformity into the multiple networks of competing systems the MTA had inherited over the years from the private companies and the TA, dating back to the city’s takeover of the IRT and BMT and it’s graphic preferences. 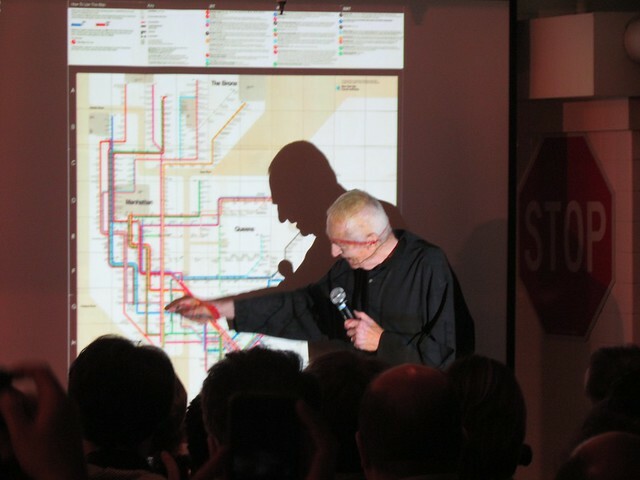 In contrast, his seemingly simple 45- and 90-degree angles on his subway map increase the complexity, because it was supposed to be part of Vignelli’s plan to detach all but the most rudimentary connection between the system and the actual layout of the city — confused riders were supposed to consult the more graphically accurate neighborhood maps at the various stations, which were never implemented. Riders would rather just deal with one map that at least gave them a clue as to how the various lines connected with the real world. So in the end, Vignelli’s fame is based on the map, but his more lasting legacy in Helvetica to the MTA is his station signs. Vignelli did not use Helvetica font in the early days. Akzidenz-Grotesk was back in the day. We are still using that font right now only on subway cars rollsigns in the R62/R62A car fleet and some station platforms. Actually, some newer car classes also use Akzidenz-Grotesk (R142A, R143, and some R160 cars). Are you sure? If you look at pictures, I’m sure you’ll see what I’m saying. He wanted Helvetica but the sign shop at the MTA didn’t have a license for Helvetica and so Akzidenz is what the MTA used instead. The MTA wasn’t very faithful to his work and planning. They kind of did it half-assed. Sound familiar? His map still lives on , now we have two maps. Only if they could add blue color water, parks, beach, Major public institutions, etc. The worst part of his signage was the insistance of always placing the arrows on the left even when they belongs on the right. I found that extremely confusing to have the arrow pointing to the word like –> Exit. Instead of Exit –> it took the MTA something like 20 years to fix that. Am I the only person who doesn’t like the Vignelli map? That’s not to say I like the current either. Behl, transit just seems to absorb people in absurdly impractical serial theoretical masturbation. Ignoring design considerations (as most of us do), I don’t think that many people actually like it. There is just a disconnect between design people who fawn over it and the desires of people in meatspace who are stuck with the implications of the serial theoretical masturbaters. How can you be hung up on design considerations and conclude it works well even if most people don’t like it? Vignelli is a relic of the generation of design modernists who sought ideological purity over practical concerns. That would be fine, if there were some higher moral calling, but I don’t see that here. I strongly suspect that none of us (the responders on this board) is qualified to judge the value of the various approaches to mapping the New York City Subway system. It does not seem like much of a stretch to suggest that none of us needs any sort of map and, therefore, cannot evaluate a particular one’s usefulness as a navigation tool. As my wife said, when asked by a friend “what app” she used to pan trips, “Oh I just ask Elvis.”. In short, I can only judge a map as “art” (based on its aesthetic appeal) and not as an exercise in Information Design. And, given that we are dealing with art, there is no right answer (or, perhaps, many many right answers). If I like the Vignelli map better than the Hertz map, then it’s the better one for me (or vice versa). But again, that’s an entirely subject and irrelevant conclusion. The “right” answer as to what’s the best map is based on science, not art, and is discoverable by testing with real people who do not already have the system committed to memory. Only when we subject a design to rigorous testing will we know which works and which does not. Personally, I believe the Vignelli design to be a fine work of art, but – honestly – I have no idea how it works as a guide to the subway system. I use the map all the time. Usually it’s to double check a small detail in a trip that is abnormal for me. I imagine most regular users who ever deviate from a regular commute are similar in that regard. These people expect geographic realism, so Vignelli does not serve them well. It could well be that people who are new to the system and don’t know local geography are better served by Vignelli or something like it. Admittedly it’s not quite scientific, but we did try Vignelli and it wasn’t well-received. Vignelli’s map, and his plans to have people seeking actual topography consult neighborhood maps at the specific stations reminds me of those twin-bottle epoxy glue products, where you mix the contents of Tube A and Tube B together to create the bond. While it might be effective, most people just one one tube of glue that’s already pre-mixed, so they can just grab it, apply the product and go. Same thing here — people for the most part would rather deal with the inelegancies of the post-1979 map as a stand-alone guide than go through the two-step procedure Vignelli wanted subway riders unfamiliar with routes and/or neighborhoods have (and as noted elsewhere, he was equally as gumpy with WMATA over their revisions to his original 1976 station graphic designs, which in many cases required a 90-degree head tilt to read the lettering in normal fashion. Changing the style to normal left-to-right may have negatively affected the ‘look’ but it gave riders less neck pain). But the current map doesn’t have geographical realness either. It might be somewhat closer but as I’ve learned from watching a whole group of “new to NYC” grad students attempt to use the map as a geographical indicator, it’s a mess. And by appearing “geographical” it only makes ti worse. People don’t understand how distorted the city is. Most just end up using Google because at least then they get a “real” geographical map. By trying to do both the current map doesn’t do either well. You not the only one. Its pretty much the subway buffs and the design community adore his work. Or even the people who sell old Vignelli maps online make a lot of money. (OVERPRICE on the useless map to this day). It still is “not” beautiful. I highly recommend Michael Beirut’s memories of Massimo linked above. His essay and the related comments are very moving. Massimo Vignelli should be remembered for much more than a subway map. His design sense and generosity of spirit stand out as a testament to the man. I am sorry I was never able to hear him speak in person. The original 1970s Massimo Vignelli subway diagrams helped me to explore the subways. As a high school student traveling to/from the Bronx to the westside midtown – his subway map told about a huge new world to discover. While many talk about the face of the subway map, they often neglect to mention the detailed notes of the various lines on the other side of the map, notes for each subway line. What trains ran when – normal hours, off-hours, weekends, terminals of the various lines in detail – all of that information on the back of the map. Information that was useful to have before exploring all of the various subway lines. Comparing the front and back of the map allowed me to formulate questions – that I would attempt to answer while visiting the line for the first time. Then I would take out pen and paper and trace a subway track diagram of what I saw riding from the front of the train. How can the B and N skip the DeKalb Avenue station rush hours but stop there all other times? How does the QB train start during the rush hours from 57th Street? How come the E train always stops at 50th Street whether it is local or express down Eighth Avenue? These and many other questions were waiting to be answered. This was at a time when the Transit Exhibit had not opened, and well before my best friend Richard bought me a copy of Stan Fischer’s Uptown-Downtown! With my subway map and notebook in hand, standing at the front of the train the subways were a new world to discover. The color schemes for each line made understanding the subways easier (at least to me) but it was both the details included and the details omitted that were to be discovered. Trips to various libraries to read more about the subways also helped. Before the transition from the old signs to the newer signs, the older signs were a source of much useful information. In any case, my exploration of the subway begins with these maps. wonderfully put! This is the map I grew up memorizing and obsessing over.. I love the different colors for each line and I would turn the crank on roll signs in the subway cars just to see a different color/line. I loved it when trains that were out of service would barrell through a station because it meant i might see roll signs from routes i didn’t travel…QJ, M, etc.. I too would look at the detailed notes and rewrite them on index cards. I wrote a 30 page book report in 5th grade on the subways using Uptown-Downtown. The 1972 map is framed in my lving room. I love the intended purpose of the Vignelli diagram, but the Kick Map (http://www.kickmap.com/) is IMO the best of all. I only wish Eddie Jabbour could get as much recognition. It’s his maps that hang in my living room. It’s a great map. I use the Transit app for getting around most frequently, but I check the Kickmap to figure out where I am in the system. I only use the MTA app to get status updates. My biggest gripe with Vignelli’s map was actually rectified when it was modified for use as The Weekender on the MTA’s website. Having that excessive number of random colors never made sense to me, as there almost seems to be no correlation between routes. Granted, this may have been a byproduct of someone else’s thought processes, but his map didn’t quite help out with that when it debuted. Still, his design is far better than some earlier designs which were even less useful because they didn’t even try to indicate what routes went where on the map itself. One could argue that this view is biased simply because I was only born in 1995, but I just think the Hertz map is more aesthetically pleasing. That’s not to say I think Vignelli’s is worth disregarding; rather, I believe it just simply wasn’t as useful as the Hertz design. “stubborn, funny, cantankerous man” — add arrogant. Well, he was a graphic designer. Comes with the job description.